Jaya Jaitly’s métier has been the world of crafts people. Her experiences about setting up the Dilli Haat to provide craftsmen with a wider exposure and her documentation of artisan’s concerns is informative for those uninitiated in the world of crafts. The real fireworks are when Jaitly comments on happenings in the public life, which she joined in the mid-1980s. Jaitly had started her public life as a social activist providing succor to the victims of the riots of 1984. Her set of socialists was characterised by an intense hatred for the Congress and its posturing on democracy and secularism. Their dilemma, then as also now, came from the fact that there was never a clear and definite response from the Indian public on what course Indian politics would/should take. In the event, by the 1990s, they were forced to join hands with anyone and everyone who claimed to be anti-Congress. It is with amazement that a non-political observer notices how they managed to remain sane in the midst of conflicting demands of ideology and real politik. Much of this dilemma is clearly seen in this collection of essays. 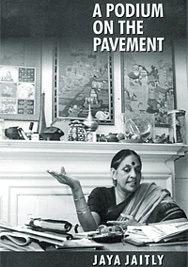 The range of these essays is vast; giving a glimpse of the diverse interests of Ms Jaitly. The Nehru-Gandhi family comes in for special excoriation. Nasty comments are made about Sonia Gandhi’s presence in public life. Even Priyanka’s choice of a double-barreled surname evokes Jaitly’s ire. The Congress brand of secularism is criticised, while great effort is made to find excuses for the BJP brand of communalism. Jaitly had to suffer considerably because of the media coverage of the arms bribery case and the match fixing case. One involved George Fernandes, whom she holds in high esteem, and the other her then would-be son-in-law who was finally exonerated of the charges of match fixing. Jaitly tried to scribble her way out of the media court and reach out to the public, explaining to them that both George Fernandes and Ajay Jadeja were innocent. Such is the nature of the media with its spur of the moment concerns and ability to make and break images that her efforts did not yield much result. No one was interested in the truth. While Jaitly charges the media for suppressing the truth and suggesting the falsehood, one is reminded of some silences on her part as well. There is no comment on the entire unsavory episode of George Fernandes, the then Defence Minister, being strip searched twice at the US airports, once when he was on an official visit and another time when he was in transit. Being humiliated could be a mistake. Everyone is most curious about what exactly happened and how the minister and his colleagues in the government responded. For that maybe, we will have to wait for another time when Jaitly pens a more systematic memoir of her public life and experiences.